A couple of friends are visiting me in Seattle, but the weather has been damp and dreary. Today we made the best of it by exploring Olympic National Park, including the Hoh Rain Forest. The opening image and the shots below are my favorite forest photos from the outing. 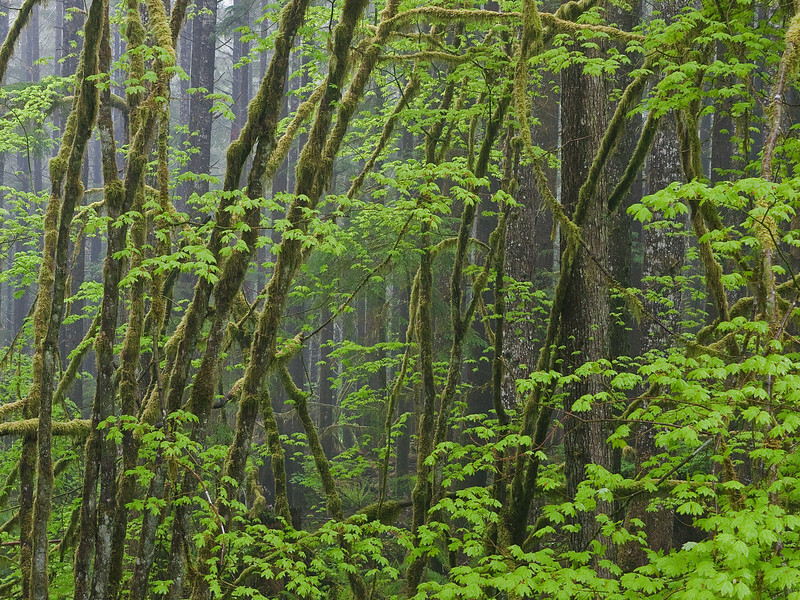 A light drizzle can do wonders for forest photography. The colors are richer, there are no harsh shadows, and the venue is typically not very crowded. I almost always use a polarizer when doing this kind of photography. It will significantly decrease glare from reflective surfaces such as wet leaves and rocks, providing more contrast and deeper colors. Of course, a tripod is a must as the exposure times are often several seconds long. I also recommend taking along a lens hood, if you have one, and a lens cloth. Chances are the wet climate will leave water drops on the surface of your lens or filter. The hood will help minimize this, and the lens cloth can be used to safely wipe off any moisture that makes it on to the lens surface. If you don’t have a “weather-sealed” camera, you may want to take something to protect your expensive gear. A plastic or zip lock bag works great. I hope you enjoy the images. As always, you can click on the pictures to go to the original gallery. Once there, you can see the images at larger sizes, peruse the shot settings (including GPS coordinates), and explore other galleries. Linda, thank you! That was the message I was trying to convey with these photographs…damp but certainly not dreary. I glad you enjoyed ‘em. I recognize “Mossy Cascades” as the creek on the Sol Duc Falls trail. No waterfall photos this time? Ryan, thanks for the comment. I did take some waterfall picts, but wasn’t terribly happy with any of them. I may post them at a later date when I blog about how to do waterfall photography.